Reigning champion Jacob Despard, with a handicap of 0.75m, is the 2019 backmarker for the Men’s 120m Open and quietly confident he could become only the second back to back winner of the Stawell Gift. 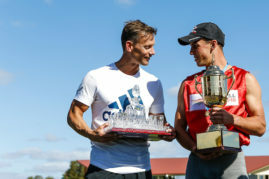 Last year’s favourite to take the famous 120m Open Gift, Jacob described his win as “pretty unbelievable” and something he has wanted since his first visit to the iconic event at Central Park, Stawell in 2013. Despard, who recorded a personal best time of 10.40 over 100m at the Sydney Track Classic last month, is not fazed by being the backmarker. Jacob rates Josh Ross’s chances, along with Jason Bailey and Queenslander Jayden Gilfillan, as the ones to challenge him for the title in 2019. However, if he can pull it off Jacob will join the great Bill Howard who took consecutive wins in 1966 and 1967. Coach Scott Rowsell believes that the Men’s Open will be really close this year, and while Jacob has a pretty tough handicap, he runs particularly well on grass and is confident on the big stage. “It will obviously be a lot tougher this year but Jacob is quietly confident he can get the job done” said Scott. Rowsell also has the backmarker for the Women’ s Gift with Maddie Coates starting off -1m, and another young athlete who could be in the mix – Jara Konteh (5.5m) – a previous World Juniors contendee and Keilor Gift winner.